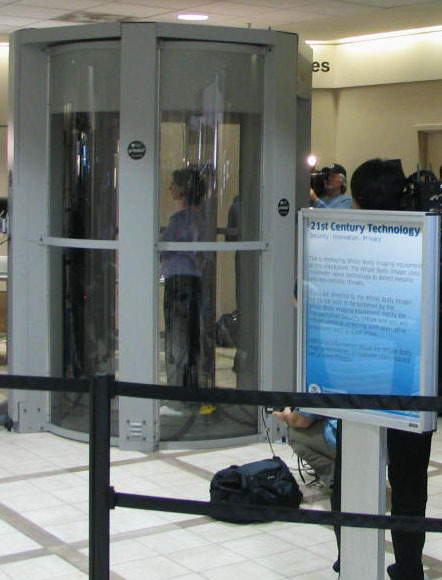 Millimeter-wave holographic scanning technology has been deployed as a screening option at Los Angeles International airport since April 2008. Nearly 250 millimeter wave devices are now installed in U.S. airports and 600 installed worldwide. Ultimately, TSA plans to deploy about 1,000 body scanners at U.S. airports, about half utilizing millimeter wave technology. The Millimeter Wave Holographic technology, or millimeter-wave, highlights Pacific Northwest National Laboratory's radar imaging and optics capabilities, which use non-harmful, ultrahigh-frequency radio waves to penetrate clothing and non-metallic barriers to detect and identify concealed objects as well as obtain accurate body measurements. Millimeter-wave technology passes harmless electromagnetic waves over the human body and the reflected signals are used to create a 3-D image in a computer that looks much like a fuzzy photo negative. The signals are similar to cell phone signals but less than 10,000 times the power of those signals and they do not penetrate the skin. The roots of the technology date back to the 1960s when researchers at Pacific Northwest National Laboratory, operated by Battelle pioneered the development of optical and acoustic holography—the foundation of the millimeter-wave technology. In 1989, PNNL started working with the Federal Aviation Administration (FAA) performing feasibility studies and the first patent was issued in 1995. Today, the next generation technology is actively being sought by PNNL. A test trial of millimeter-wave technology occurred at London's Paddington railway station in January 2006. Other potential venues for screening include airports, military checkpoints, border crossings, court houses, and government buildings. . 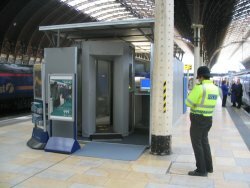 In 2003, millimeter-wave holographic scanning technology was first licensed by Battelle and introduced as the SafeView Scout system for security applications. SafeView, a start-up company that based its business plan on this innovative technology, is a good example of commercialization at its best. Battelle, through PNNL, developed a technology--a company licensed it and contracted with the Laboratory to develop a security system. L-3 Communications acquired SafeView in 2006 and renamed the millimeter-wave whole body imager - ProVision™. The technology has also been licensed to Intellifit, a company focused on consumer measurement technologies, for body measurement applications. Millimeter wave technology has several potential applications—it can be used in standoff detection of explosives, in custom safety equipment (resulting from the capability of performing 3D body measurements), in ergonomic applications (body scans for designing custom cockpit seats), in entertainment and gaming (digitization of body and putting oneself in the game as an avatar), in physical fitness applications (serving as a physical digital tape measure if one is on a diet), in non destructive evaluation (for moisture detection in wood structures), and detection of objects concealed in walls.